In today’s digital world, knowing how to read, write, and participate online is a foundational skill next to reading, writing, and arithmetic. At Mozilla, we call this Web Literacy. Combined with 21C Skills, these digital-age skills help us live and work in today’s world. People everywhere should have the knowledge they need to tap into the full power of the Internet -- and to use it to make their lives and the world better. Whether you’re a first time smartphone user, an educator, an experienced programmer, or an internet activist, the degree to which you can read, write, and participate on the web while producing, synthesizing, evaluating, and communicating information shapes what you can imagine—and what you can do. Read our white paper to learn more about why Mozilla cares about Web Literacy. 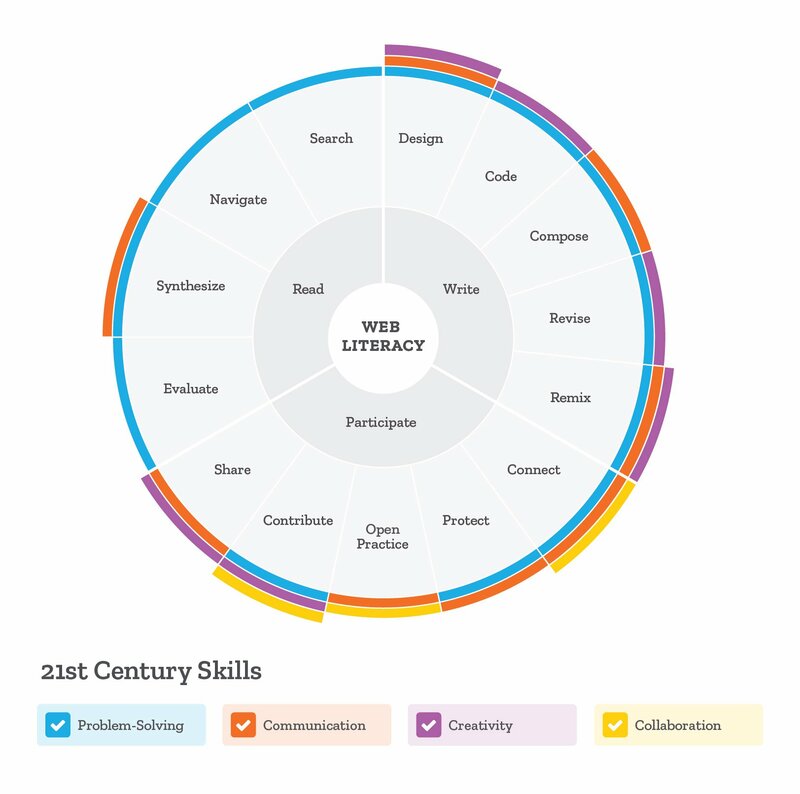 With the goal of bringing more equitable access to the internet for more people, we have worked with a diverse community of educators, practitioners, and technologists to identify core Web Literacy Skills and 21st Century Skills. We fundamentally believe that the internet has the ability to transform communities and help us achieve our goals if we have the skills to wield its power. We've curated a core curriculum to teach these skills, and our hope is that people will use this curriculum, build on it, improve it, and share it with others as a way to make more people Web Literate and keep the internet healthy and open for all. Open Source and Remixable: All lessons can be freely used, shared, and modified for specific audiences and use cases. We use the open collaboration platform GitHub to facilitate sharing, reuse, and development of the curriculum. Participatory and Learner-centered: We emphasize social, collaborative, and participatory meaning-making and strive to match fun and meaningful offline activities with every online activity we offer. Hands-on Application: All lesson plans encourage learners to design or create a tangible product, performance or model as a part of the lesson. This promotes active learning where facilitators are in a supporting role and learners explore content and apply skills through the completion of a project.